So who is this Supercharged Science person? Hi! I am Aurora Lipper, and I welcome you to my web site. My company, Supercharged Science, which provides science education to families and educators, evolved as an expression of a value I am committed to in my life and want to offer others: envisioning, empowering, and taking massive action. I attended Cal Poly State University in San Luis Obispo, California, where I obtained a Bachelor's Degree in Mechanical Engineering (with a minor in Mathematics and senior project in Rocket Science) in June 1996. While in California, I received an Air Force sponsorship to pursue further studies in a Master's program with Edwards Air Force Base in Dryden, California. I was also a student pilot and shortly thereafter received my private pilot license. In June 1997, I completed a Master's Degree in Mechanical Engineering at Cal Poly State University, with a thesis in flow patterns of F-15 engines and with 4.0 GPA and was awarded Graduation with Distinction. 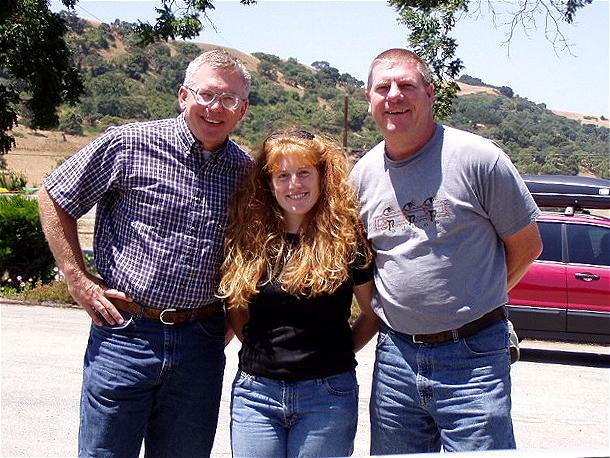 In Fall 1997, I became one of the youngest instructors in the engineering department at Cal Poly State University, where I taught lectures in Statics, Dynamics, Engineering Systems, and labs in Fluid Mechanics, Vibrations, and Engineering Design. One of the things that hit me was how bored the students were in the classroom. I couldn't figure out why they weren't interested in science or engineering! I loved what I was working while I was at NASA, working on rockets and jets. Why didn't the kids seem to have the same excitement? I decided to investigate further, and I looked at how kids were taught science before they reached college. Building robots by learning to solder circuit boards. 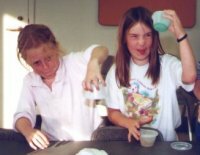 When I saw how kids were being taught science, I realized that I'd be bored, too! That's when I decided to do something about it. But what could I do? At first, I had no idea, so I continued along my career track to becoming a university professor. I began doctorate studies at Stanford University in the High Temperature Gas Dynamics Lab (Combustion) and spent my free time at the local children's museum in the San Francisco Bay Area. After six months, I realized that studying in a dark corner about a subject no one really cared about (Simultaneous Laser Spectroscopy and Schlieren Photography of Hypersonic Combustive Fluid Flow... See? Not all that interesting.) for the next seven years was not the fastest track to making the biggest impact on young minds. I returned to the university and taught for several years as an instructor at Cal Poly State University while creating my own unique set of physical science lessons for younger kids based on the college lectures. I still had no audience for the 'younger lectures', but I kept working at it anyway. So what were these 'younger lessons' about? Teaching elementary schools about supersonic combustion did not seem like a good idea at first. But after awhile, I realized how much physical science was really needed in all levels of schools (in private, public, and homeschool environments). And I taught my first science lesson at an elementary school thirty minutes away - and the kids loved it. And once the word got out, I had to hire 12 additional staff to handle the requests! The following summer, I put together the best classes (yes, there are some classes I'll never try to teach again!) into a week long day camp and offered to everyone in the local community as Science Camp. I have now taken the opportunity to have a wider range of students as I dedicate my life work to educating and inspiring kids and educators through my science business Supercharged Science. 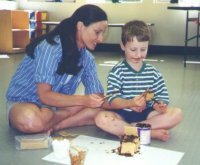 Many parents and teachers have learned the teaching strategies needed for self-motivated learning through my intensive workshops and camps. I share a unique perspective on overcoming the stressful and overwhelming tasks of teaching science in a meaningful and impactful way through my experiences as an instructor, speaker, scientist and engineer. Speaking of giving back, the next place to go is the Free Stuff section, or you can continue reading a recent interview about me and my work. "What traits do you think can help someone succeed at their science experimentation?" "Determination, resilience, and acuity. Most people give up just before what they are trying to do actually works. Edison tried thousands of times before he got that light bulb to work, and every "failure" was recorded as a success... he knew which elements burned and for how long (or exploded), just in case he'd need it in the future (which he did!). "As for acuity - know what you are getting. Observe your results carefully. Why did the roller coaster fly off the track? Too fast or too slow? Asking better questions gets better results. Just saying 'It didn't work!' does not get you anywhere." "How does someone do a great science experiment?" "I figure there are three basic steps to doing great science experiments: first, figure out what you want to do. Have a clear vision about what you want to test or try out. Second, have a plan for doing it. Design the experiment, map it out so you know what to do. Third: measure your success. Lots of people, scientist or no, skip this vital step. "Think of yourself as an airplane. Before you leave the ground, you know exactly where you are headed (this is your vision). You made sure you have enough fuel, and you didn't forget your passengers (you mapped out a plan). Did you know an airplane is off-course 95% of the time? The airplane course-corrects to keep it headed in the right direction... it doesn't check once in awhile - it's an ongoing process (measuring success)." "Who would a student contact if they want to do science experiments?" "One of the most difficult aspects of a science experiment is becoming overwhelmed by the magnitude of variables (things you can vary in each experiment). Another is not knowing where to find materials. "This site is a great place to get started. By downloading the free resources, you can get weekly science experiment information delivered to you - experiments you can do right now at home with the things you have (or a quick trip to the store). Most experiments require local grocery store items, and the few special things are available locally in cities, online everywhere, and through wholesale catalogues. "Get in touch with your local college or universities. There is usually someone in the physics or engineering department who either has kids or likes kids, and are willing to help you find new resources for your child. Your local community section in the newspaper can be a resource area as well." "What do you recommend for a parent with no science skills looking for ways to help their child?" "Remember that your job is not to know everything. Your job is to play with the kids. This means going to the library together with your child, getting science experiment books, and making time to just be with your child. When they ask you, "What's happening?" when they rub a balloon on their hair and stick it to the wall, you should turn right around and say, "Gosh. I'm not sure. It looks like that balloon just stuck there. Did you glue it?" "Sign up to download our free science experiments. Get started right now!" "What additional tips would you be willing to offer someone interested in expanding their classroom curriculum?" "If you truly want to be successful in your science classroom, you can start by creating a vision of what you want. Is it a mad scientist lab with beakers of colored substances constantly burping and bubbling? Is it a student-run interactive robotics lab, where they run it part time as a hands-on museum open to the public? What do you really want to create? "Get creative by visiting local colleges with your ideas and requests. Put an ad online or in the university paper looking for energetic physics students to help you build an astronomy lab on the roof or design an interactive slime lab that refills itself. Visit the library and fill your card with as many resources as you can. Totally immerse yourself in the process, and you will be amazed and dazzled by the results." The next step is to go visit the Free Stuff section! Simply enter your email address below and click the orange button. 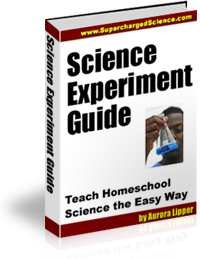 I'll instantly send you the free Science Experiment Guide. "I just started your Chemistry unit and have been shocked at how enthusiastic my 12 yr. old son is. I confiscated his slime so he can work on other subjects! I know now to do activities before reading the text to engage him." "I love it that I don't have to do a thing! I set my kids in front of the program, and later find them excited and working on something new they created themselves. This program is exactly what we needed! " "I gave my reluctant 10-year old son your program. Three hours later, he made us late for an appointment because he couldn't tear himself away! He watched the videos over and over and built things I've never seen before. Thank you so much!!!" "Thanks so much for the fruit battery science fair project. She won second place today in 8th grade division! It is an especially meaningful "victory" for us because Lynne has a learning disability." "Forget the kids! I'm excited by science now--teaching and learning. I was almost in tears when we saw the videos and started the experiments because I realized that she has something to follow if I get called away. Thank you again for filling a need in my daughter's life."